We constructed a nice living room on the second floor of base 3 last night (overlooking the library). 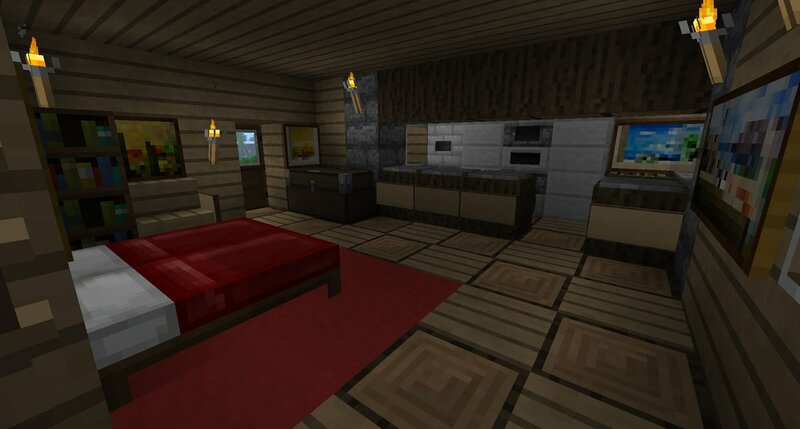 The original intention was to make it a bedroom, but the space we dug out was awkwardly large. 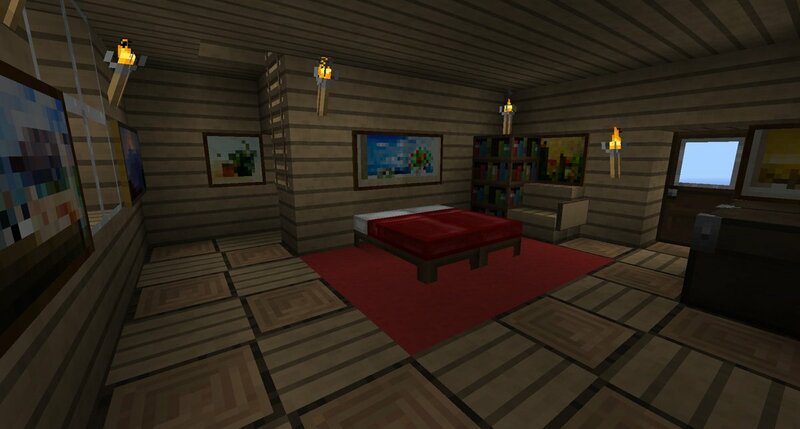 Also, I really wanted to tile in a nice wooden floor with a red throw rug underneath the double bed. 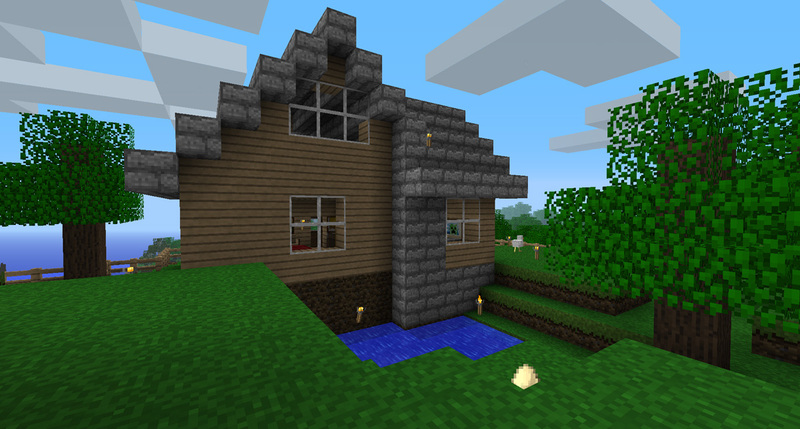 Unfortunately, because of the way the first and second floor are laid out, that is an awkward thing to do unless I want a multi-color ceiling above my wheat farm. So, I built a log cabin up top instead. Dave fenced off the top area; We still need to level out the dirt but as of now, there’s a nice grassy plateau with a wooden cabin, a natural pond and some trees. The spiders can still jump over certain areas of the fence and the creepers will explode if you get too close, regardless of what side of the fence you are on. I may just carpet the entire area with torches for safety or at least shovel off more dirt below the fence line. We have already had a few….setbacks. 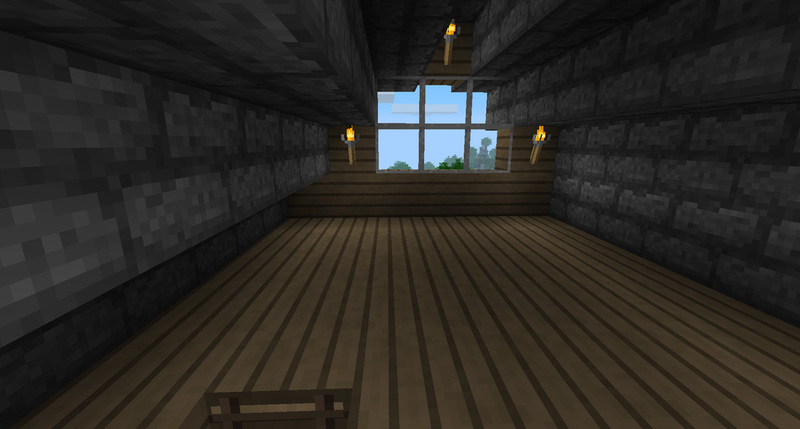 The cabin’s interior decorating isn’t entirely original: I found a great thread last night with awesome decorating ideas. I really liked the kitchen ideas in that thread. Here’s a picture of the back of the cabin, which is more interesting than the front (which is little more than a wooden wall with a door). The cabin is a studio bedroom with a small kitchen and a loft. I’m not sure I like how some of the roof turned out. 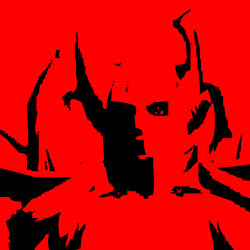 It looks odd in my opinion, but I can fix that later. The ladder on the left leads up to the loft. If you go past that, there’s a staircase around the corner leading down into the second story of the base (note to self: post pictures later). The bed is sitting on a 3×3 red wool carpet. For some reason it took a while to find the rest of the roses that I needed to dye the wool. There are a lot of yellow flowers in the area but not red. At some point I would love to add a fireplace on the left wall, but don’t want to burn down our cabin. This is the view from the other side near the ladder. 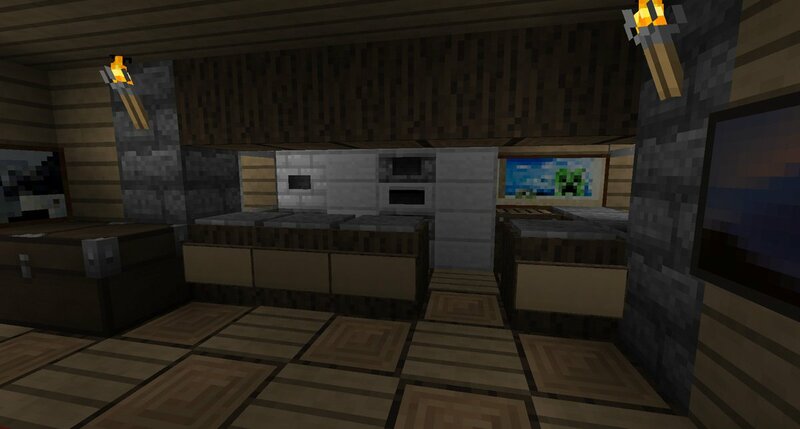 Here is the kitchen. I had originally built a bread dispenser (dispenser + bread + button) in the store room, but moved it up to the cabin. Hadn’t considered that it would make a decent looking fridge in combination with an iron block. The counter-tops are made up of a log with signpost paneling and stone buttons for granite counters. And here is the loft. I don’t really know what to place up here. Another bedroom? Bookcases? Chests? We will decide later.